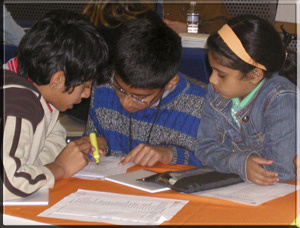 The Bay Area Mathematical Olympiad (BAMO) is an annual competition for hundreds of Bay Area middle and high school students, consisting of 5 proof-type math problems with a time limit of 4 hours. It is typically held on the last Tuesday of every February. This year's test will be on February 26, 2019. The exams are proctored at schools and at several open sites around the Bay Area. They are graded the following weekend by a group of Bay Area mathematicians, teachers, and Math Circle enthusiasts. The BAMO awards ceremony, which takes place the weekend after the grading, has become an annual focal point for the Bay Area middle and high school math activities; about 200 students, teachers and parents gather for an exciting day of Mathematics, including a math talk by a distinguished mathematician. The BAMO organizing committee members are Paul Zeitz (University of San Francisco), Zvezdelina Stankova (UC Berkeley), and Austin Shapiro (Proof School). Problem 2, 2007 The points of the plane are colored in black and white so that whenever three vertices of a parallelogram are the same color, the fourth vertex is that color, too. Prove that all the points of the plane are the same color. Problem 4, 2005 There are 1000 cities in the country of Euleria, and some pairs of cities are linked by dirt roads. It is possible to get from any city to any other city by traveling along these roads. Prove that the government of Euleria may pave some of the roads so that every city will have an odd number of paved roads leading out of it. Please visit our BAMO Archives for solutions to these problems and the complete collection of problems and solutions from past Olympiads.